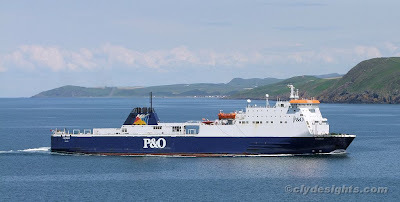 Relieving the two P&O ferries in turn for their overhauls is a vessel more usually found sailing between Liverpool and Dublin. NORBAY was built by Van der Giessen de Noord in Holland in 1994 for North Sea Ferries, and she entered service on their Hull-Europoort crossing. At 17,464 gross tons, she is 166.77 metres in length, and has a service speed of 23 knots. She can carry 114 passengers, and 156 12-metre trailers. NORBAY was transferred to the Irish Sea in 2002, and is partnered by her twin sister NORBANK.